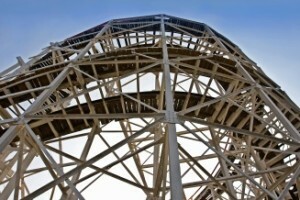 The roller coaster has its origins in St. Petersburg, Russia, as a simple slide that took thrillseekers down an icy ramp past a variety of colored lanterns. Catherine the Great gave this custom a boost when she fitted her imperial sleigh with wheels for summer use. The next leap forward came when a French traveler beheld this odd national pastime and imported it to his homeland. Adapting the ice slide to a milder climate, the French soon learned to erect a track with a groove running down the middle. A bench with wheels was fitted into the groove, and down the Parisians went — facing sideways. Some historians argue that it was this device, which rolled as it coasted, that inspired the term “roller coaster.” Others trace the first usage to Stephen E. Jackson and Byron B. Floyd, two coaster inventors from Haverhill, Massachusetts, who worked in the early 1880s.